I think you should welcome failure though. Without well and truly tanking you wouldn’t fully appreciate the times you get it right or half right. If your work was really one success after another it would soon get so dull that getting out of bed in the first place would be to dreary to contemplate. Failure feeds the hunger to succeed. Without that spicy scent of all too possible self humiliation it is hardly worth putting brush to board! Most painting pundits, including me, harp on about practice and honing your skill until the readers yawn. What you should be developing and honing is of course your mindless optimism that the upcoming session of paint splish-splashery will produce at least a masterbit, if not a full on masterpiece. Without that delusional belief that the dam will break, the run of stinkers will end and the worm will finally turn up trumps we would never start in the first place. Something to work on in the failing arena is coming back for more. If something ends in humiliating defeat then pick yourself up (after a good old wail and curse) and go at it again. You will be amazed by how often you can trump a tragedy with a triumph. Many duff paintings after all are duff because you got over-confident and slipshod. There is nothing like a train wreck to make you concentrate properly. I should really document all my own, not only missed the bull but didn’t even hit the board, moments but I tend to wipe them off if in oils or tear them up if in watercolour. I am not going to stop doing that however as the act is extremely cathartic and helps me start another one immediately! So when the elegant swan you were hoping for turns into a dead ugly duckling don’t despair. Think of the Phoenix rising from the ashes and how much sweeter the triumph of a half decent daub will feel if it is well garnished with epic fails. Whatever you do though don’t deny your failures or that may well hold back progress. Perhaps don’t admit them to all and sundry, but even if you keep them secret from others admit them to yourself. Art is after all being honest with yourself whilst lying to others. Tricky to know what to post after that… was vaguely tempted to post a spread of missed marks, but I will just do my usual mix of hits and misses. A rare chance to do a portrait sketch. Only an hours worth but great fun and so, so difficult. 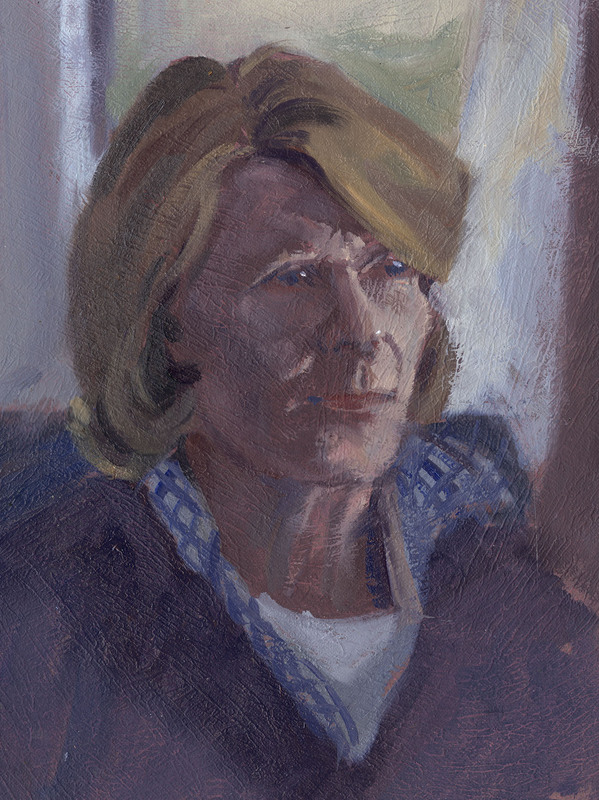 I think to do a really good portrait it takes several sessions with the painting going through several “ugly” phases. Likenesses are so hit and miss that you just have to take the risk of destroying something that is just OK to try and get something that really catches the person. Oils A4 ish. This an example of coming back for more after a failure. The previous picture was beyond bad and I wiped it off. The light was rapidly going so immediately I turned and did this. Not anything that will ever go in a frame but at least something that captures a fraction of how the place felt. So you go home feeling the effort was worth it. Oils 10in by 7in. 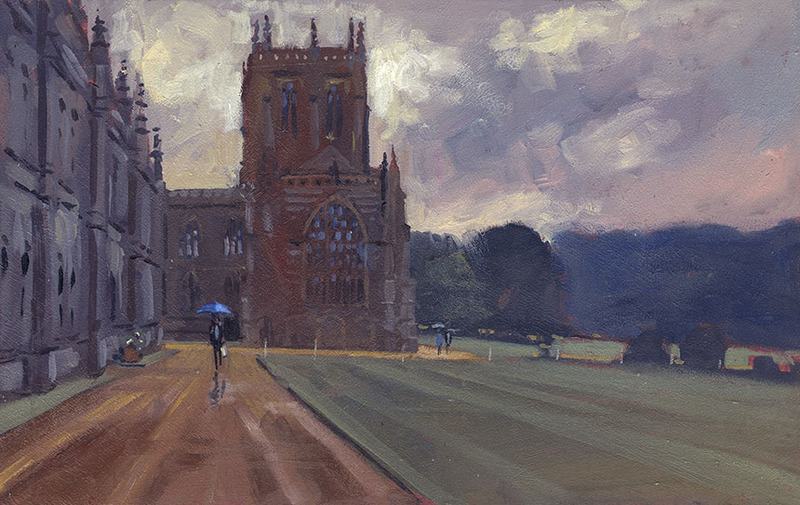 A wet day at the Milton Abbey. An exercise in trying to hint at the architecture rather than over explain it. I sometimes like to revel in the mad complexity of buildings but here the main thing was the mood of the day so I tried to throttle back the detail in the buildings. 16in by 10in Oils. The rain really set in after doing the Abbey and I got soaked doing this on the way home. 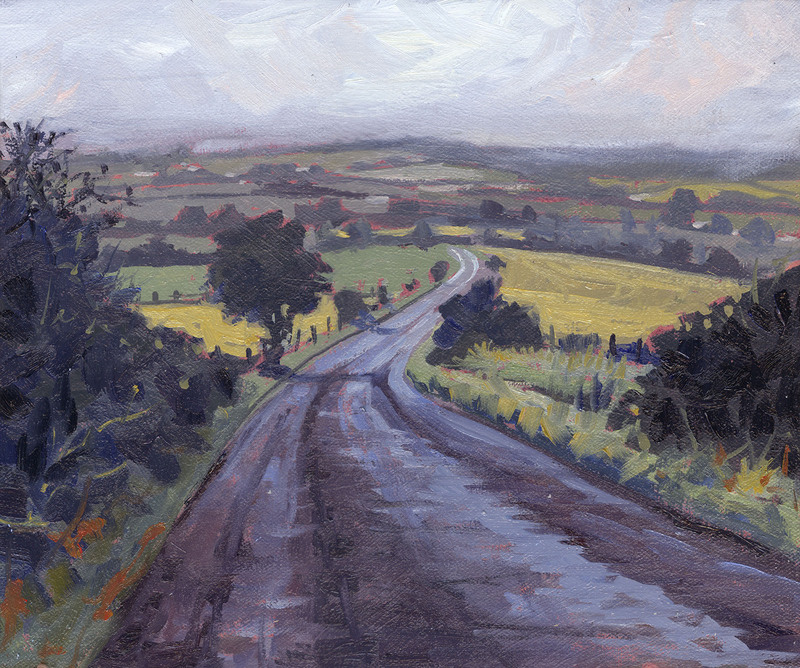 Because I was keeping my umbrella over my painting the rain ran down my neck and all the way down to my socks… This is the view down towards Okeford Fitzpaine from Okeford hill and a view I have had my eye on for a while. In clear weather there is a tremendous panorama across the Blackmore Vale which is wonderful but somehow too much. With the rain and the murk obscuring things it looked much more paintable. 12in by 10in Oils. A day out painting in Weymouth. I couldn’t resist doing a widish view though I would have probably been better finding a more intimate corner. This nearly got wiped off as it looked sort of dull and dreary. Once home though I could see I had the sky a couple of notches too dark in tone. As soon as I changed that the whole mood of the picture was transformed. I will overglaze the land and buildings once it is dry which will improve it further I hope. 14in by 10in, Oils. Off to the beach next. I love the old fashioned seaside feel of Weymouth especially on a sunny day when the beach was thronged. I loved the silhouette of the buildings so painted up the beach rather than down. Odd that you assume the sea is there even though it is out of sight! Quite a tricky subject and I had to move the figures about as I didn’t want any of them to specifically draw too much attention. 10in by 11in Oils. Last one from Weymouth. As I was walking down the beach a cloud shadowed the distant hills and the foreground beach leaving a slash of light across the middle. I sat down to paint in the hope of it happening again. With that in mind I toshed in the foreground with a shadowy tone ready for the right moment… which never came! So I had to do the foreground at home later. Fortunately I had a couple of snaps of the light effect from earlier that gave me a rough idea. 16in by 10in Oils. I drawing from a while ago. 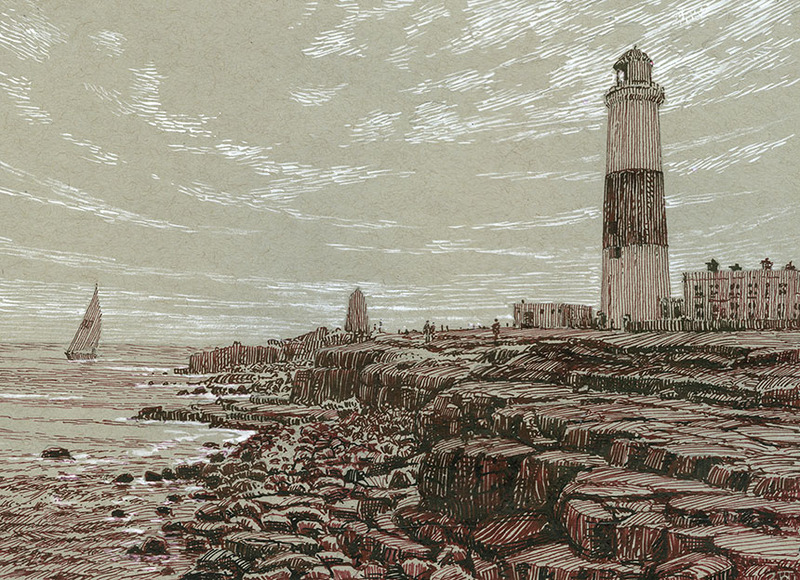 I did this as a sketch for an oil painting of Portland Bill but got a bit carried away. A4 pen and body colour. 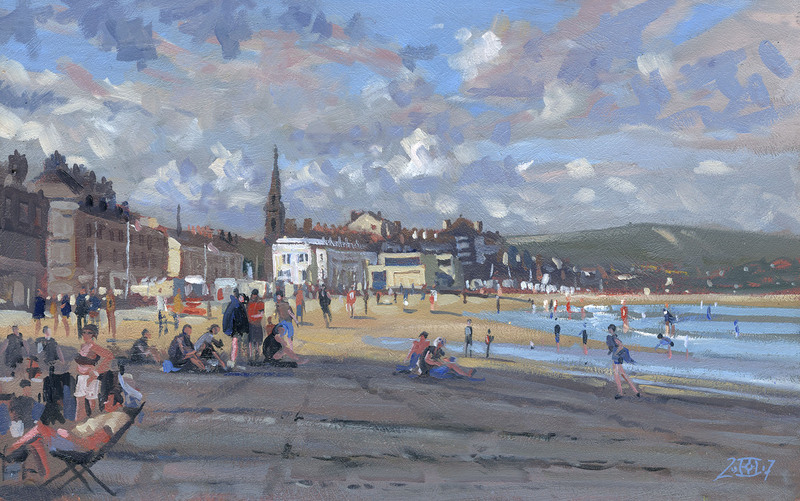 Sticking to the Weymouth theme another drawing done on a previous visit I forgot to post. 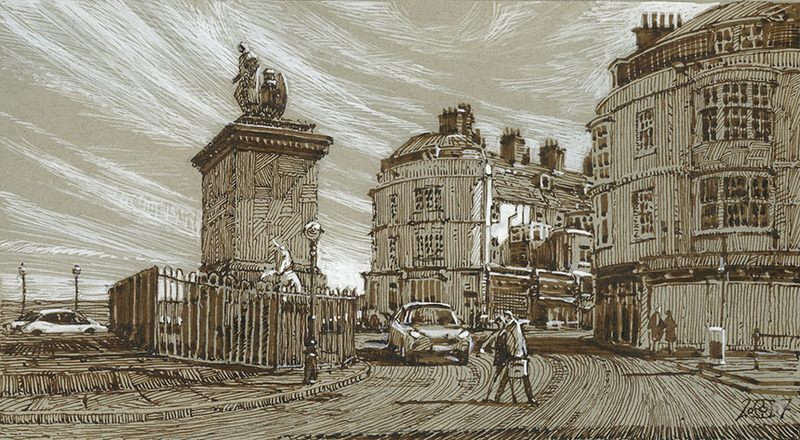 I have this new grey toned pad from Strathmore which I quite like as it is a tad darker than the Turner Blue paper I usually use. The downside is that it is not as tough and you have to be a bit careful not to tear the surface with the pen. Also it doesn’t take washes very well so the white has to be hatched in. A4 Pen and Ink with white. Natural, if ever there was a word or idea that has been more misused I can’t think of one. It’s inverse too, “unnatural” is often brought to bear on anything we vaguely disapprove of when we can’t think of a rational reason reason for the dislike. “She/he is a natural.” Purports to explain talent, or more likely as a comforting explanation of our own lack of achievement. We use it to explain bogus logical sequences: “They over thought the whole thing, so naturally it all went wrong.” Natural has been put in front of so many things that I hardly know where to start. Natural Philosophy. Natural Science. Natural Law. Natural Wastage. Natural Birth. There are forces of Nature. Naturism. We explain our own misdeeds as going against our better nature. Behaviourists and others agonise over nature versus nature. Nature is at the same time the nurturing mother and red in tooth and claw. In general we mean natural as made or carried out by intellect as opposed by stuff that just happens. The division of the universe into things effected by the workings of conscious thought and those that are not. A problem is of course that intellectual processes are also just stuff that happens, so any neat division starts to look a little fuzzy. People seem to love to divide things into Natural/good Unnatural/bad in an Orwellian Animal Farm manner. Natural ingredients are plainly better than unnatural ingredients even though almost every single possible ingredient has, due to breeding or processing, had something done to it. Part of the blame is of course the dippy Rousseau idea that humanity in its natural state is especially noble. An idea that we are quite fond of which is as far as I can see not supported by any evidence or logic. At the same time if we do act naturally we are accused of being “beastly” or “feral” … dammit you just can’t win can you? I play music as well as painting so often find parallels between the activities. With music as you progress you soon run into the problem that at first you have to “make” it happen until you are practiced and skilled enough to “let” it happen. Musicians talk of muscle memory, but as all memory takes place in the brain “motor” memory is a better description. The brain stores frequently used routines (playing scales) in a different way to lesser used ones. When enough of these actions are automated then playing a tune is often a matter of turning off the conscious control and just letting it happen… naturally. Musicians also know that any conscious intervention to the action stream can cause you immediately to crash and burn. There you have to draw a line under the parallels as music is a linear sequence of actions to a strict timetable whereas painting is a more languid temporally flexible affair. However the learnt sequences of actions are important to both. Here is where the popular view of the art of painting seems to have taken a strange turn. If you talk to most painters they don’t practice, that is we tend not to try and establish routines in any systematic way. When I was learning to draw with a pen I spent many hours practicing parallel hatching and controlling the weight of a line. Not to make a finished drawing but just to learn fine control. To learn the airbrush it was even more necessary as the motor actions had to be so precise. So why are musicians more likely to practice the nuts and bolts of their art separate from performance and painters mostly scorn to? How many of you have practiced making brush marks or watercolour washes in isolation away from making a painting? Or accuracy for its own sake rather than in the making of a bit of potential art? 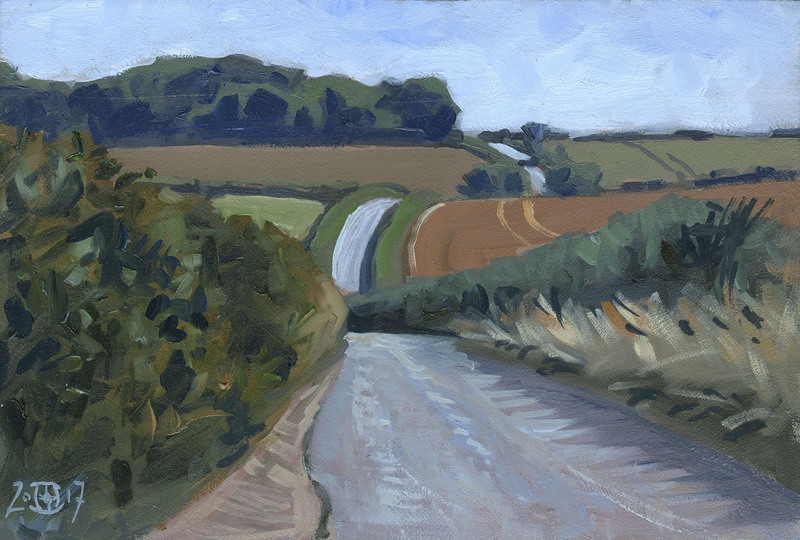 With painting we tend to go down the road of learning on the job rather than honing our skills. Part of this is that we tend to believe that such systematic practice is an unnatural activity whereas creating a bit of art should spring into being naturally. There is of course nothing wrong in learning on the job. You don’t need to gain skill by organised practice in either painting or music. It does however give greater freedom if you do. Mind you I would be the first to acknowledge that being over systematic can also be a problem leading to inflexibility. As in most things a degree of balance seems to me the most likely strategy to produce consistent improvement in ability. I see many potentially capable artists hamstrung by this belief that art is naturally present in all of us and we merely need to remove obstacles of thought, self consciousness and introspection to allow it to naturally flow. Hence all the slightly comical attempts to “let go” and be “free” to which my question is, let go of/be free of what? This is a topic I return again and again to as it seems to cause a great deal of frustration in people who would love to be able to paint or draw better than they currently do. Alas much of the “wisdom” that is on offer from approved published and teaching sources is frequently misleading due to their proponents just parroting guff about being “free”, “loose” or instinctual and never really questioning the underlying ideas. We would love to believe in magic as the advertising world well knows with products being magic this or that, but neither painting or anything else happens by magic. It happens by practice and study. Just as with learning walking as a toddler, we try, fail, get up and try again until we learn how to walk to whatever destination we might choose. The magic, if you must have some, might be in in choosing the destination as against the means of travel. So you see it is the natural way of learning things, so why not apply it to art? There is a backlog of stuff I haven’t published so the following bits of artiness are a little random! 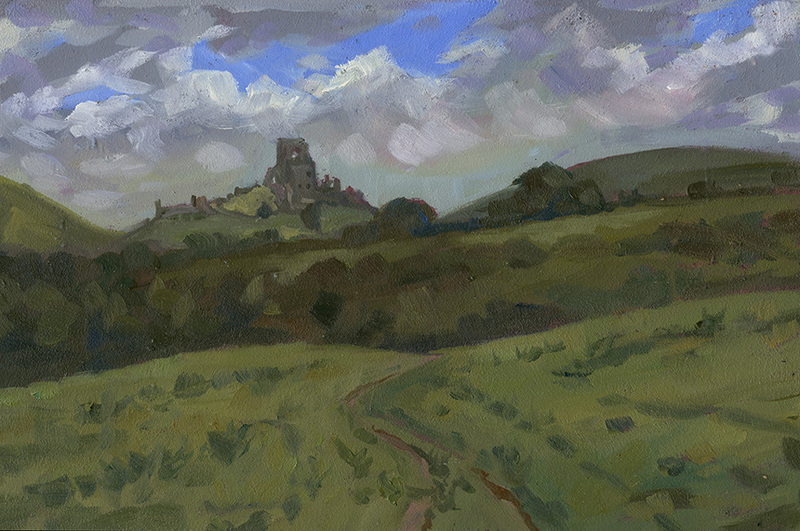 This was done in a rush when passing through Corfe one evening. 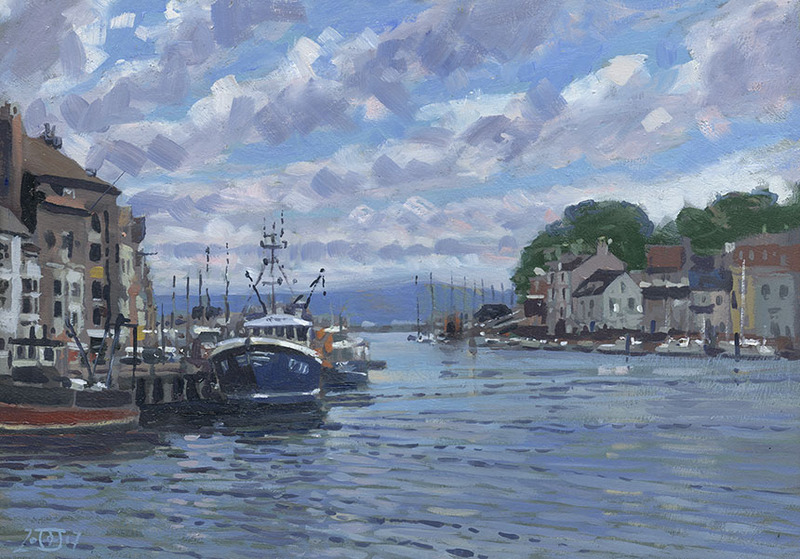 The plein air it is built on was done in just 3 colours Raw and Burnt Umber and Burnt Sienna and of course White. The intention was to drift colour in at the end but I ran out of light. The result was a little uninspiring so the board got put to one side. A few weeks later I was short of something to paint and thought I would have a fiddle. I put colour in the sky first intending to work my way across with glazes after that. As soon as the sky was in it had a very dramatic effect and the picture looked somehow almost finished. I dropped bits of sky hue into the foreground and a few hints of ochres and orange in the landscape and then broke for lunch. On my return I suddenly thought it looked more like a nocturne than an evening painting so I added an impossible moon and the picture was done! 16in by 8in Oils. More nocturnal wanderings. 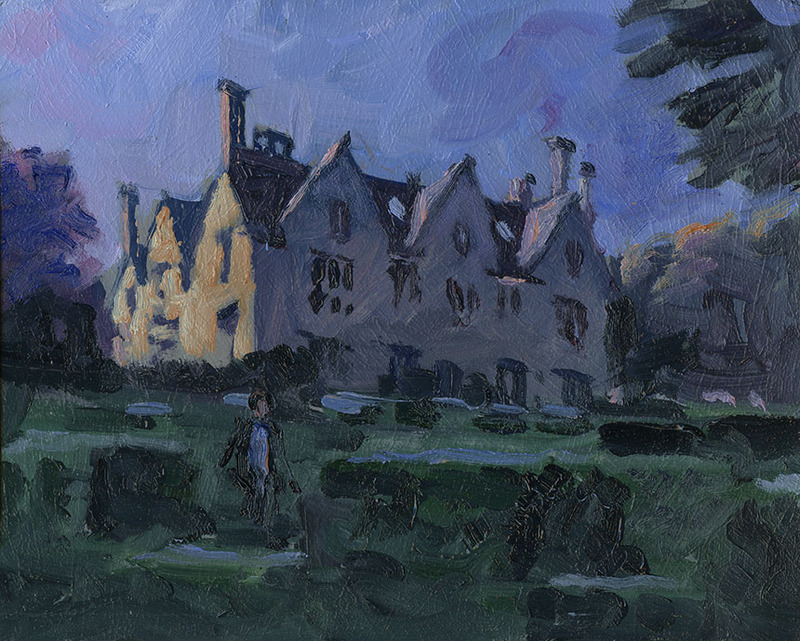 This is the school Hanford House, I was retuning late from a very unsuccessful attempt to paint Hod hill when I passed Hanford and saw how the evening light was giving a great mood. The drawing is mostly from memory of the watercolour I painted a week or so before as I couldn’t get into a good compositional position without risk of being taken as a dodgy prowler! I blocked it in very quickly in about 20min as the light faded thinking to rework it later but next morning it looked just fine if a bit spooky. 10in by 8in Oils. A visit to Salisbury on business. 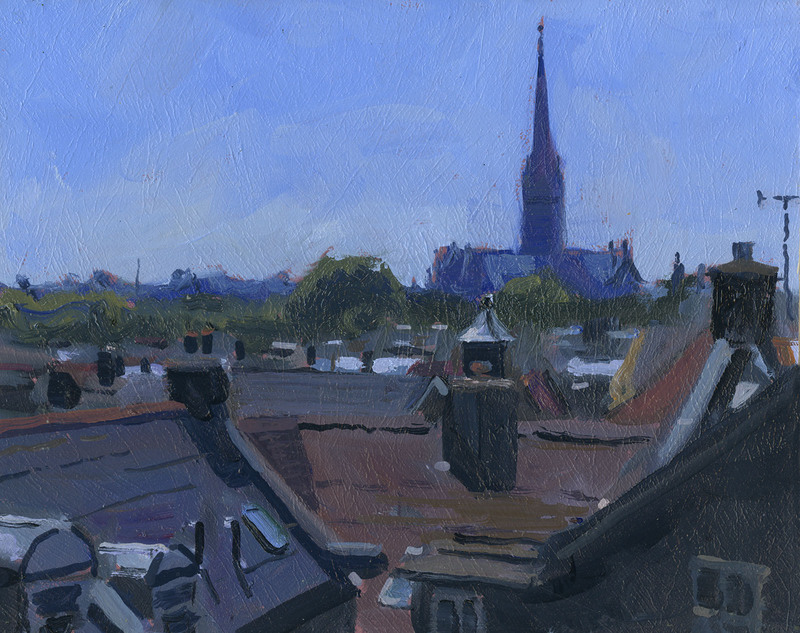 I have painted this view from the top of the car park before so couldn’t resist quickly having another go. I must get up the in the early morning or evening as it would be fantastic subject in dramatic light. 10in by 8in Oils. Corfe on a mostly overcast day. A great position to view the castle but it needs a better day. 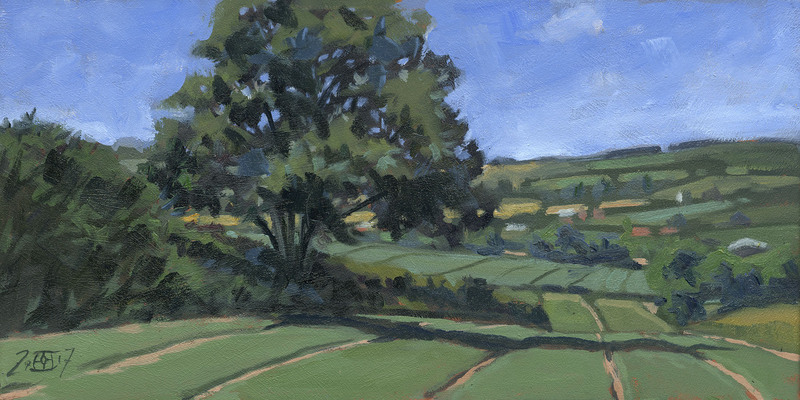 I might try to do a studio one though as there were some flashes of good light as I painted which I have photo ref of. 10in by 7in Oils. Same day same problem. It is always a toss up at this time of year between getting your greens too murky or too… well… green! 10in by 7in Oils. An embarrassing one. Sometimes I regret my decision to post the ones that went wrong! The Landrover was a desperate attempt to jolly it up. I will return to this view though. 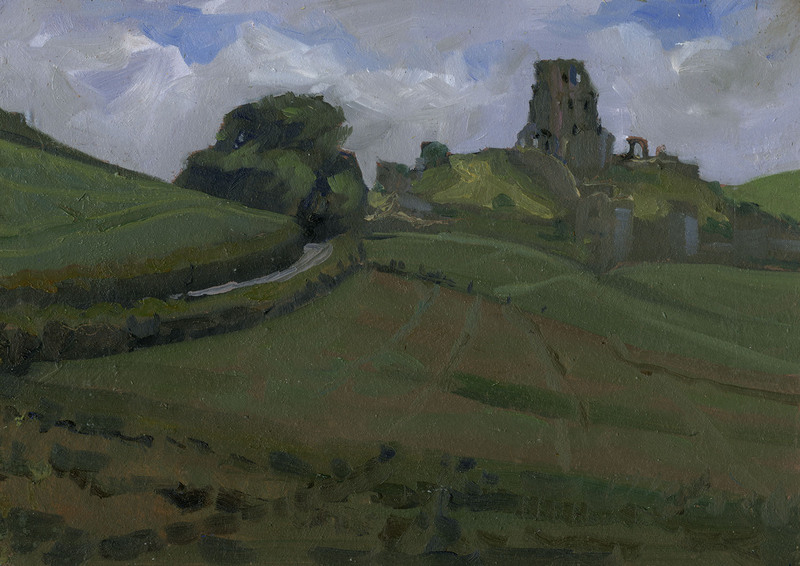 I might even set to and try to rescue this one… 14in by 10in oils. 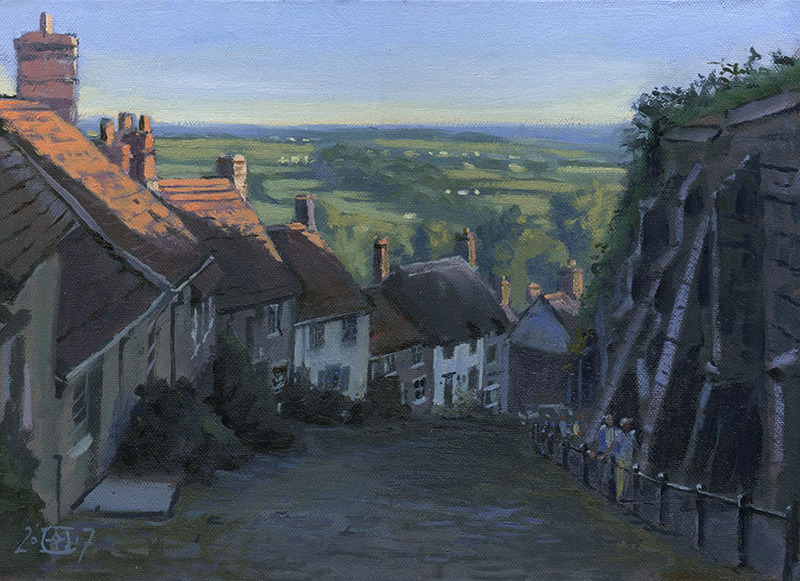 I have been neglecting to do much studio painting again so here is a version of the ever chocolate boxy Gold Hill. I went to a private view in the gallery nearby as the light was going over. Private views are odd events where you drink execrable wine and talk while ignoring the pictures on the wall. So having lost the will to live I snuck outside to take a few snaps on my phone. The scene is so well known that it is tempting to try to kick against the perfection of the subject, but here I just went with the flow. 14in by 10in oils. 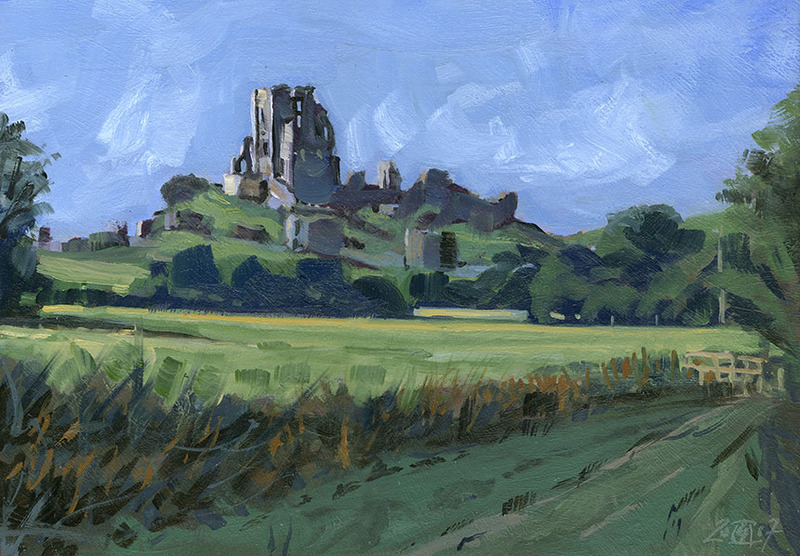 At last Corfe in good light! I had been dropping pictures off at the excellent Gallery at 41 in the town. I had intended to explore the different possibilities and views as it is a subject that fascinates. It is so much easier painting when the light is interesting, I brushed this in pretty briskly and was pleased to get the balance of detail in the castle about right. It is a subject that is very easy to over do. 14in by 10in Oils. 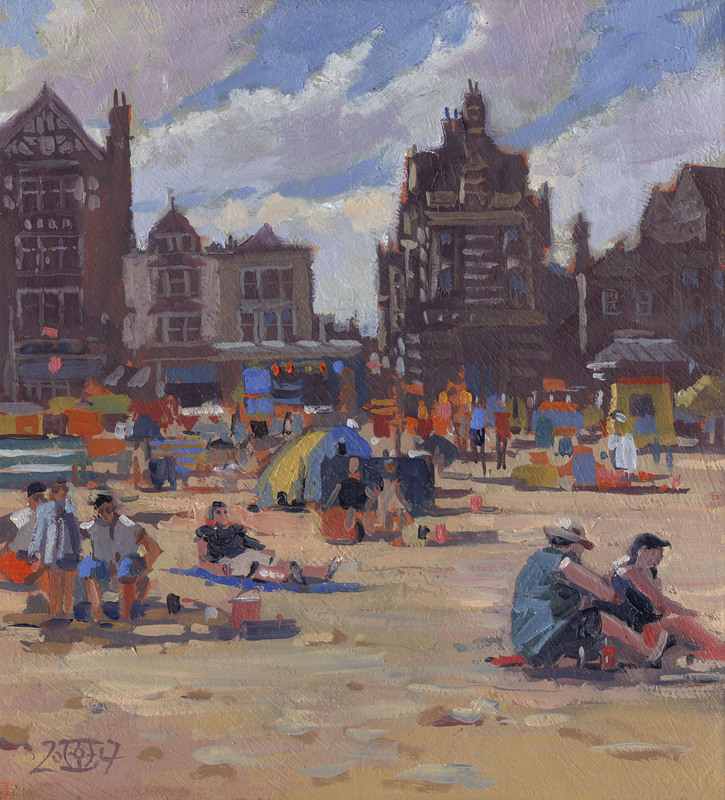 A day out painting with a painting friend Sue Fawthrop. 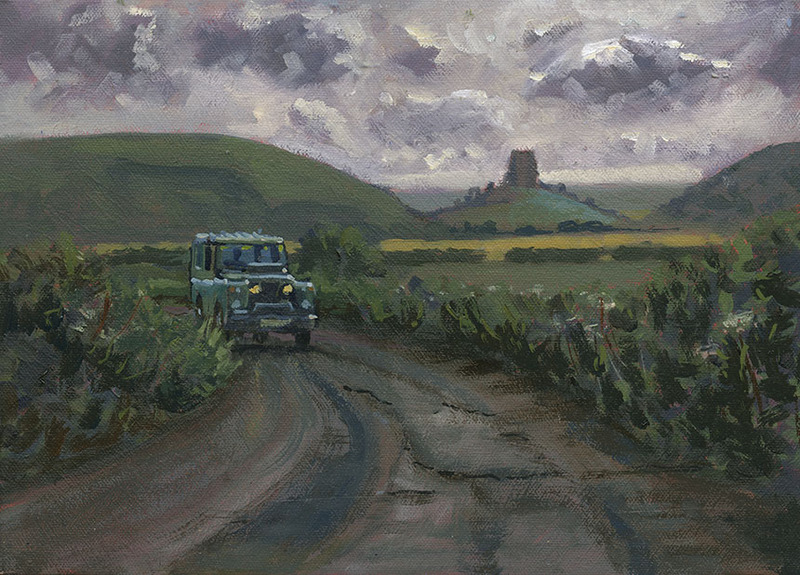 As she was driving I only vaguely know where this is… near Dewlish I think. Those summer greens in full sail… the sky was full of puffy clouds that I had to mostly take out as the whole picture looked too busy once I had it home. 16in by 10in Oils. Another nearby. I painted one from across the other side of the road which was ghastly. It is underneath this one so the evidence is destroyed! Sometimes a painting just doesn’t fly so there is nothing for it but to wipe it off and give it another go. I very rarely turn a flawed picture around by struggling on with it. This one was a pleasure to paint and who knows maybe doing the previous stinker helped this one work better. 10in by 7.5in oils. 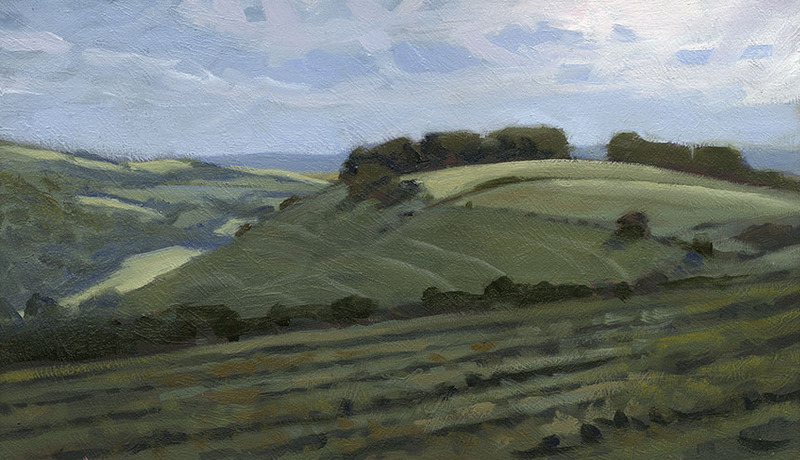 The light looked interesting so I zoomed up to the nearby Fontmell down to have a quick paint. 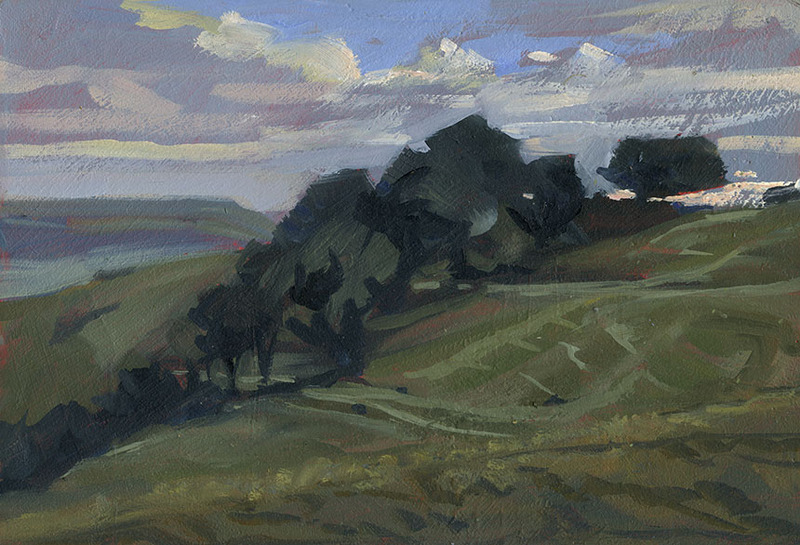 I threw an old painting of the down that was dull and uninteresting and done in poor light into the car and painted this directly on top of it. Even though the light was quite different it made painting this so quick and straightforward that it is something I will try again. 14in by 8in oils. That’s it caught up on the oil paintings at least!